Have you ever thought about creating an online course? Online Courses are a great way to earn an income from sharing your expertise with others. But figuring out how to get started planning and creating a course can be a bit overwhelming. I’ve spent the past several years creating a process for building online courses. Today, we’ll go behind the scenes of that proprietary process. I’ll share how we go from a rough outline of our course plan to a finished product. And I’ll detail each step in the production of our courses. Today’s post leads up to our final Behind the Scenes episode next week when we go inside our online course platform. Our primary revenue source at Jefflalytics is online training programs. We have developed one to two classes per year, every year since 2015. 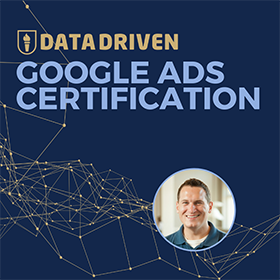 PPC Course teaches students how to master profit-driven advertising on Google AdWords. This program also helps students achieve their AdWords professional certification. 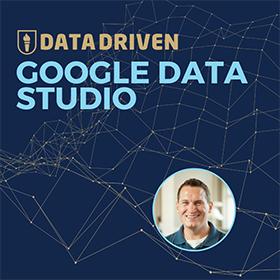 Analytics Course provides students with a 360-degree overview of Google Analytics. It also teaches them how to set up Google Analytics to work for their business needs. 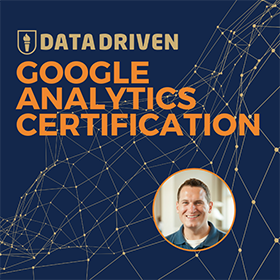 And it helps our members achieve their Google Analytics professional certification. Agency Course is a comprehensive business program for agencies, freelancers, and consultants. In this program, students learn how to scale and create more profit in their business using our tried and tested agency growth frameworks. 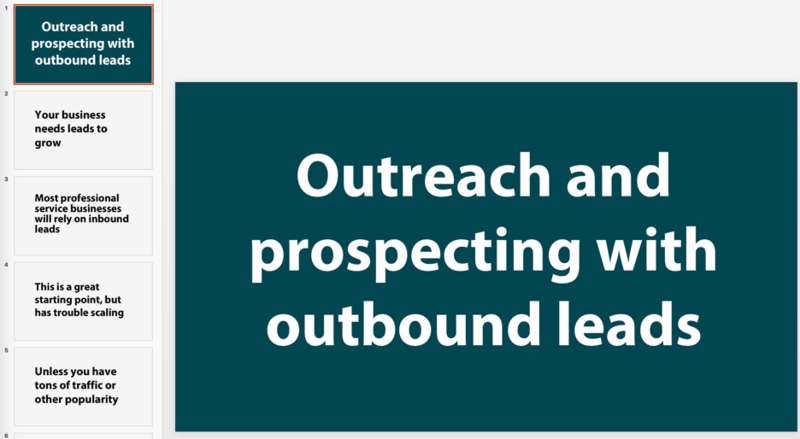 Sales Jumpstart teaches students how to get new clients for their agency and freelance business. In this program, we focus on sales and lead generation. And we teach students how to crack the million dollar barrier. This training is currently an add-on to Agency Course. The 90-day challenge has helped us refine our recording, writing, and editing skills. So we plan on producing new courses with more efficiency than we ever have before. Look for more of our premium training programs, coming soon! How do we create a course that people want? To date, our courses have been successful. We have over 5,000 students in each of our PPC and Analytics courses. Agency Course and Sales Jumpstart launched this past November. So far over 200 students have joined this program. But before any of these courses launched, it took months of thinking about what content I should include and how to best structure the course for maximum learning. Then we surveyed our email lists and asked our subscribers what type of courses they wanted us to create. After we validated our course concept with our audience, we spent months planning the structure of our classes. Months recording and editing videos. Months of writing course materials. And years marketing the finished products. Let’s talk about the work that goes into creating a full online training program. I have broken down our online course building process into ten steps. 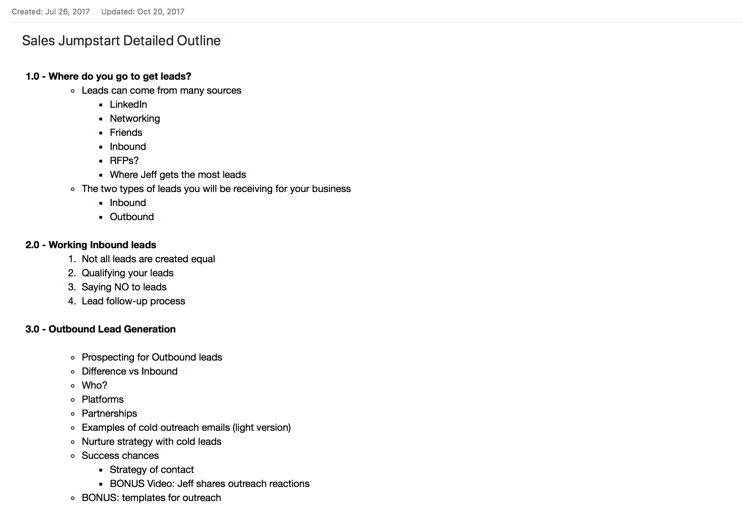 The rough outline is mostly a brain dump of my initial thoughts about the main topics in each course. 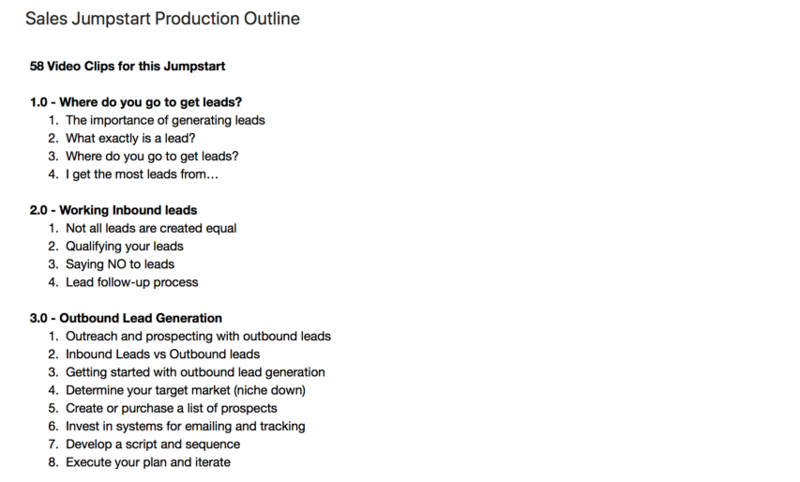 Below is an example of my first outline for Sales Jumpstart. I spent two to three months thinking about this course before I put anything on paper. I thought about the structure of the course, and all the things people need to know to have a great sales organization. It took a while to figure out how to summarize all the skills I have learned during the ten plus years I have been selling services as agency marketer. The challenge is to turn this knowledge into something that’s easy to follow, easy to digest, and people can use in their own business. 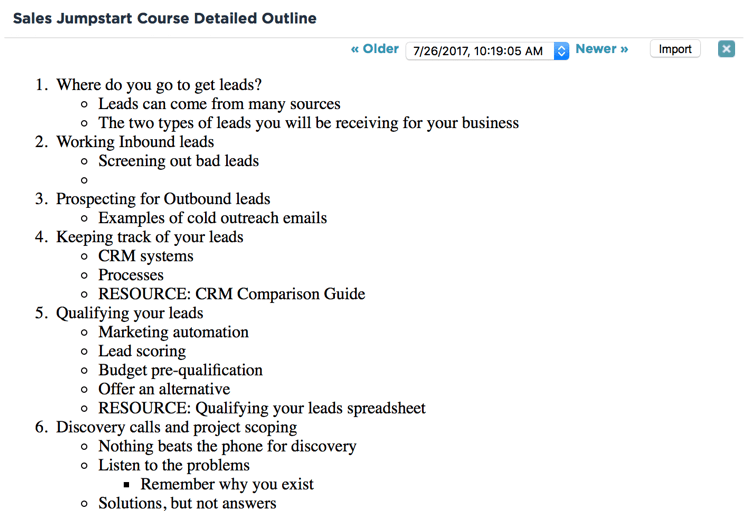 Below is an example of our lesson outline for Sales Jumpstart. When I build the lesson outline, I like to think of how the course will flow. This outline was modified about three months after I created our rough brain dump. The research outline isn’t quite a lesson plan yet. But, it adds more depth, and it starts to map out the real substance of the topics in the course. The slide decks go through a similar process to our course outlines. We start with a very rough draft, just to get some material in place. Then we research and flush each slide in our deck in preparation for the production phase. When we’re in production mode, we finalize our course templates, so our materials start to feel and look like a finished product. We also finalize our production decks and develop a script for each lesson in the course. We create production decks and organize the on-screen materials for every individual lesson. Our production outline breaks down each topic into four to five video lessons. Each lesson will wind up being about 5-10 minutes long. As you look at this outline compared to the initial rough draft, you’ll notice how much more depth we add to each segment. Moving from our rough outline to a final production outline takes about three to four months. I am sure this transition could progress faster, but this is the master plan for our course that will enroll students for years. So, I like to take my time with this process. It’s more important to be thorough than to cut corners. I am going to move through steps 5 through 10 quickly. We have talked about some of these steps in our preceding Behind the Scenes posts. We’ll link to those earlier posts below. In a previous Behind the Scenes video, I discussed our video recording process. We organize every video we produce in a Camtasia file in correspondence with our production outline. We also did a previous Behind the Scenes tutorial on our video editing process. In that episode, we talked about cutting the video, adjusting the sound, and rendering the finished product. In this step, we add a written outline to each lesson in our learning management system. We also add notes for our students about the subject matter in the video lessons. At this stage, we fully develop the written material for each lesson. We add pieces of our video script, pictures, and other references into each lesson page in our LMS. We also craft the emails that go with every lesson. And we build an email sequence to delivery the course lessons to our students. This step is all about building out the lesson guides with the customer experience in mind. We restrict the course materials to member access only. We also put our customer support software in place. And we test all our customer communication channels. Then we enable and test our shopping cart system. Producing a course takes a lot of time and effort. But selling the course is the most critical part of this process. Selling your product is what makes or breaks an online course. You need revenue to keep your business running. The key to marketing and selling courses is to find an audience that wants to learn from your expertise. Then, you need to let your audience know how they will benefit from your training program. Building an audience can take months to years. Start connecting with your audience as early on as you can. Our final behind the scenes video of the 90-day challenge will be inside one of our courses. You’ll see that tutorial next week. Have you enjoyed our Behind the Scenes videos and posts? Let us know what you think about our all-access tutorials. Which one of these videos helped you the most? And was there a topic you wanted more to hear about in more detail? Let us know what you think about the Behind the Scenes series in the comments below. This post and video was episode 78 in our 90 Day Challenge digital marketing series.